This year I was able to attend the prestigious American Chemical Society National Meeting in Denver, Colorado. Our first day there was filled with exploring the convention center, and listening to interesting talks given by leading scientists in many different fields of chemistry research. One talk that I found incredibly interesting was discussing different tracers they were using to better identify abnormalities in the brain. The next day we were able to attend more talks, and I was lucky enough to see one of my professors give a talk to his colleagues. It was interesting to see him in a different context than the classroom. He did a fabulous job giving his talk, and representing Messiah College and what we stand for. 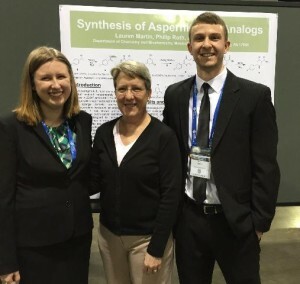 Enjoying the poster presentation with Lauren Martin (’15) and Dr. Anne Reeve! On the third day the group went to the Expo. The Expo had hundreds of vendors selling the newest instruments and technology in chemistry. There was also lots of free stuff to be had, and we all had a blast seeing the new instruments and collecting as many free tee shirts as we could. After the Expo it was time to get ready for our post presentation. Lauren Martin and I made our way to our poster spot, and began our afternoon of discussing our research with other scientists. It was a great learning experience, and I enjoyed gaining new ideas from the other students and faculty members. Our final day was spent listening to more talks, including another one given by our very own Dr. Noble. She gave a great talk discussing the difficulties of teaching Physical Chemistry. That night we were treated to a nice group dinner courtesy of the Chemistry Department. It was great to get to interact with my professors outside of the normal classroom setting. Overall this trip was incredibly educating for me. Not only was this my first national meeting ever, but also I was also able to present my research there, and learn from the other ACS members. I learned a great deal about cutting edge chemistry listening to the talks, and had a great time getting to know my professors and the other students better.